Linlithgow is still “one of the safest places to live” despite a rise in violent crime, anti-social behaviour and housebreakings. That is the view of Police Chief Inspector Barry Blair, the local area commander for West Lothian. He said it was “disappointing” to see the increase but assured residents they were tackling the issues. Figures from the latest police scrutiny report October 1, 2016 to December 31, 2016 for West Lothian showed in the period April 1-December 31 violent crime in the town had rose from two in 2015 to 11 in 2016. Two of the incidents had carried over to the following year, the chief insp said. Meanwhile, anti-social behaviour is up 12 per cent from last year from 343 incidents to 385, according to the report. 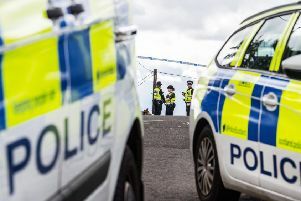 The chief insp added: “Any increase in the figures is disappointing but I don’t think that suggests Linlithgow is a dangerous and violent place. “I would say it is one of the safest places in Scotland to live, work and visit. “Figures along side that show minor assaults are down and the volume of crime continues to be low. The scrutiny report also showed an increase in housebreakings. Between April 1-December 31 2015 there were 15 compared with 21 for the same period in 2016. However, housebreaking detection had fallen 63 per cent from 87 per cent to 24 per cent. The chief insp said: “The housebreaking figures are disappointing. “People are targeting high-value cars and breaking into houses solely to steal car keys. “We’ve got an operation running targeting acquisitive crime. We have had some good results and have a number of enquiries that are coming to resolutions now. “We are finding that it is organised criminals who frequently come from outside West Lothian. Inspector Scott Robertson said: “We want people to be able to come to us if they have problems.